Police Car Cleaning: Over the time of an arrest, we understand that through no fault of your own, an offender can contaminate a police car, police van or jail cell through vomiting, urination, open sores or blood spills. General domestic cleaning with household disinfectants or cleaning with bleach is not sufficient to remove the risk of infection and contamination of other people. Cleaning by this method also does not comply with Australia’s biohazard cleaning standards ANSI/IICRC S540-2017. This is because not cleaning a police vehicle or jail cell properly can lead to infection of others with diseases and health risks. Here at PHJ Services we are trained and qualified professionals in removing the biohazard risk and undertake cleaning police cars and vans; removing any blood or bodily fluids in accordance with Australia’s strict biohazard clean-up guidelines and laws. We believe no police officer’s health or family’s health should be put at risk through exposure from unsafe cleaning methods. Here at PHJ services we take you, your family and your employees health seriously. We are fully trained and certified in police car cleaning and jail cell cleaning. We are experienced in fully restoring your vehicle to a safe condition for you and your passengers. 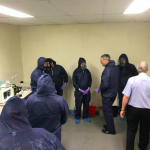 IICRC – the Institute of Inspection Cleaning and Restoration are the holders of the Australian Standard for Trauma and Crime Scene clean-up, which includes safe biohazard removal (e.g. for police car cleaning) standard ANSI/IICRC S540-2017. We are fully trained in and compliant to these standards. ABRA – PHJ Services are Certified by ABRA and trained to an international standard in Bio-recovery cleaning services. We are the only Queensland company to hold this certification. This means we are the best choice on the Gold Coast for a number of services such as crime scene cleaning, police van cleaning, trauma clean-up, meth lab clean ups and restoration of suicide cleans.